I’m pleased to announce the completion of a new painting: The Fields. This is first in a series of contemporary Wyoming scenes. It is named for the dual income usage of the land for haying and pumping oil and gas. I know, I know…it is already a buzz…why ruin the pretty hayfield with oil and gas gear? Well, because that is what is there, today, on the edge of many hayfields. And, to some, the gas pump is scenic. I think of what I heard Kathy Karpan once say about mining in SE Wyoming when she was running for governor: “To those of us from SE Wyoming, open pit mining is scenic!” I think I was about ten, so I’m sure I don’t have the quote right, but that was the jist of it…and even at my young age, I got it. As I sit writing this and staring out across a snowy white and tan prairie, the green hayfield scene reminds me of the magical transformation our land goes through each season. The color change is just astonishing! But here’s to winter- full of it’s own brand of beauty. Original and prints are available. Contact me if interested. 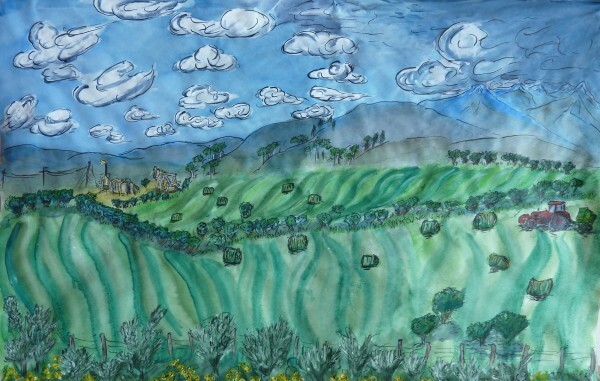 The Fields; 12″ x 18″; sumi ink and watercolor; 2011; Meg Thompson.